Although Fast Times appeared to use the same picture transfer as the 1999 DVD, it offered a different auditory experience. While the old disc went with the movie’s original monaural mix, this release included both Dolby Digital 5.1 and DTS 5.1 soundtracks. Across the board, the pair sounded identical, as I noticed no variations between the two. The tracks marked a moderate improvement over the prior mono track, but don’t expect wonders. For the most part, it focused on the front center and didn’t do much to spread out from there. With one exception, music demonstrated broad mono and didn’t show distinctive stereo imaging. The only example of true stereo came from the Cars’ “Moving in Stereo” during Brad’s fantasy. Effects showed general ambience with a little movement and panning, but they didn’t do much. The surrounds followed suit and failed to add much to the package. They reinforced the front in a bland manner and that was it. Audio quality was mediocre. Speech consistently remained intelligible and without edginess, but the lines sounded flat and thin. Effects usually came across the same way; except for the waves in Spicoli’s dream, they lacked life or definition. Music varied depending on the source, but the songs usually were moderately vivid at best. Though some worked better than others, they usually appeared somewhat thin. Nothing terrible marred the presentation, but nothing exciting happened either, so I gave the track a “C”. While the two DVDs presented identical visuals, the 2004 Fast Times offered auditory improvements. Despite this one’s flat soundtrack, at least it seemed superior to the original mono offering. That mix was very feeble and thin. The new one’s not exactly scintillating, but it did mark an improvement. Next we head to the set’s supplements, almost all of which duplicate what we found on the disc; the only new moments come from some trailers. First up is a pretty good audio commentary from writer Cameron Crowe and director Amy Heckerling, both of whom sit together for this running, screen-specific piece. They cover a mix of subjects but mostly focus on the cast. They tell us about how many of the actors came to the film as well as working with them and various improvisations. We get notes about the movie’s tone and battles with the studio who wanted it to be sillier, and we also hear about the music and other production notes. Plenty of cool tidbits emerge, such as the fact the producers tried to hire David Lynch to direct! The track becomes a little too giggly at times, but it includes a lot of solid information and proves to be a winning commentary. Among the more standard supplements are a too silly trailer, pretty good cast (seven members) and crew (just Heckerling) biographies, and some fairly strong production notes. 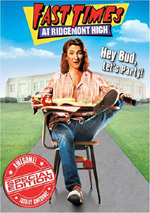 The launching pad for many famous actors, Fast Times At Ridgemont High remains an entertaining flick. It’s fun to see due to all the well-known participants, and it manages a reasonable amount of good material despite some inconsistencies. The DVD presents erratic but generally good picture quality with mediocre audio and a fairly interesting set of extras. Although I’m not wild about Fast Times, I like it enough to recommend it. Should owners of the old DVD upgrade and get this new one? Probably not. Picture and extras are the same for both versions, so the only change comes from the new 5.1 soundtracks. Those do better the audio from the original version but I don’t think the sound is improved enough to warrant a repurchase. If the new Fast Times had cleaned up the picture and added some new extras, I’d advise a double-dip. As it stands, this one is a fairly lazy reissue.